If you’re looking to buy classic Alfa Romeo cars, youve come to the right place! Alfa Romeo is the sport premium brand among the three mainstream divisions of FIAT. Similar to BMW in market positioning, but with more emphasis on style and emotion, Alfa Romeo is often regarded as the most desirable mainstream auto brand by many car enthusiasts. Alfa Romeo’s history can be split into two periods – pre-war and post-war. Established in 1910 by a group of Italian can enthusiasts that called themselves Anonima Lombarda Fabbrica Automobili (ALFA), they acquired the Italian factor of Darracq, a world-renowned French car maker, and started building cars in the Portello district of Milan. Early cars included the 1927 Alfa Romeo C6 series, the 1935 Alfa Romeo 8C 2900B Mille Miglia, the Alfa Romeo Giulia Spring and Alfa Romeo Giulietta Spider. Buying a Classic Alfa Romeo? Alfa Romeo dominated the toughest races in pre-war Europe, including the Targa Florio and the Mille Miglia. Alfa Romeo was also a force on the Grand Prix circuit, forerunner of todays Formula 1 racing. In fact, Enzo Ferrari launched his career as an Alfa race driver and was the racing team manager in the 1930s. Alfa Romeo used this racing success to attract buyers including Hollywoods Rita Hayworth and Egypts King Farouk. Reaching a broader audience in the 1950s, Alfa developed the 1900 series of four-cylinder models. The Giulietta series as it was called, put the Alfa Romeo Company on the mainstream map. Today, those looking to buy classic Alfa Romeo models continue to search for pristine examples of these truly exceptional cars. Whether you’re looking to buy vintage Alfa Romeo models including the Alfa Romeo Sprint Speciale, the Giulia Sprint, the Giulietta Spider, or the 6C 2500, the team at Beverly Hills Car Club looks forward to assisting you in your search. To learn more about the Alfa Romeo automobiles, please feel free to browse this website. When you’re ready to sell or buy classic Alfa Romeo models, connect with the Beverly Hills Car Club. They look forward to hearing from you and to helping you find the ideal Alfa for your collection. Contact us today! 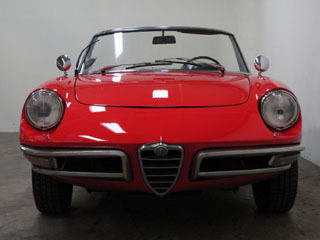 For help buying, or to sell your vintage Alfa Romeo, team with www.BeverlyHillsCarClub.com today. Our team knows exactly what makes these classic cars special, and will connect you to your dream car! We Also Buy Classic Alfa Romeo Autos In Any Condition, Top Dollar Paid.